Long Jump ~ Dante Anderson ~ 22' 10.5"
Shot Put ~ Courtney Klosinski ~ 39' 11.75"
“Take the Next Step” was Coach Corona’s mantra when he met with the team on the eve of official practice in February. This statement, based on the tremendous accomplishments of 2015, was meant to inspire team members NOT to settle, that there was still more out there to accomplish and that 2016 could be even better. Taking the next step was exactly what this team did, starting with a great performance by the distance team at the Meet of Champions back in March, then running the (at the time) second fastest mark in the country in the Distance Medley Relay (1200, 400, 800, 1600 meters) at the Arcadia Invitational in April and topped off with the boys winning and the girls just losing (by 1 point!) the Big VIII Championship against Roosevelt. The incredible display of depth and balance at Big VIII Finals seemed to give birth to the historic run into CIF the CIF rounds of Prelims, Finals and Masters. It all climaxed with the finest performance ever seen by a King Track team at the State Track and Field Championships June 3 and 4. 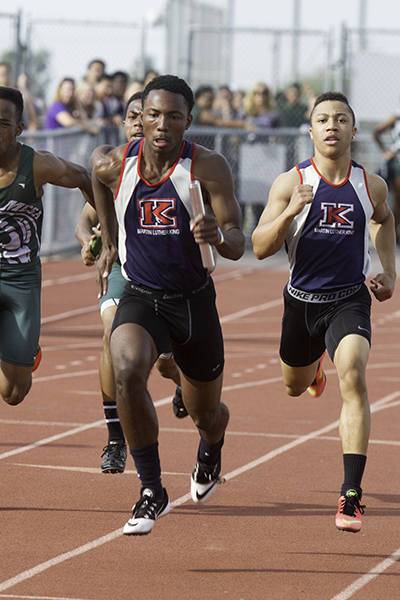 Prior to 2016, the most athletes King Track had ever earn a berth in the State meet was two. This year, six athletes traveled to the stunningly beautiful track and field complex at Buchanan High School in Clovis, CA. And what a mighty six it was. 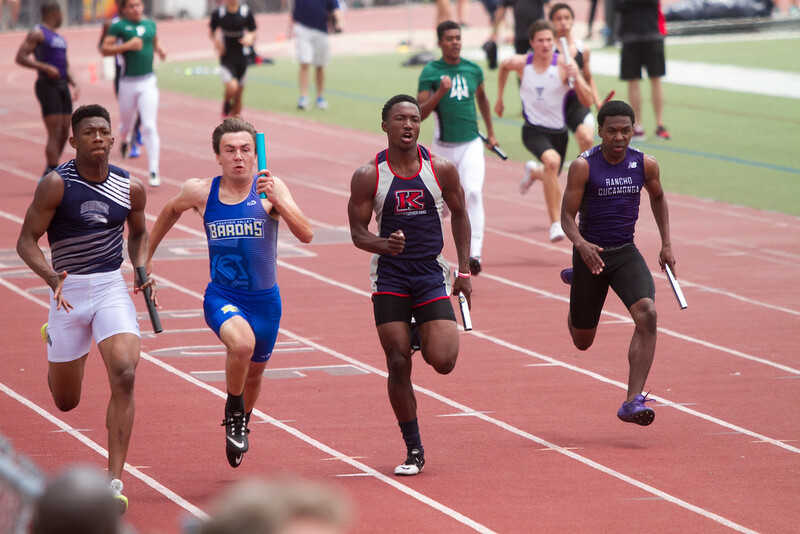 The boys 4x100 team of Saadiq Jennings, Korey Parsons, Jaylen Moore and Jonathan Essien spent most of the season toiling along in the craft of quickly moving a baton around a track. Their times were respectable, but not great. Then, after winning the league title in early May, "greatness" seemed to click into place and the foursome began a month-long assent that landed them at the Final of the State Championships. There on Saturday, in front of 8000 spectators, they took their spot in the 9th lane (indicating that they were the 8th fastest of 9 squads from the previous evening's preliminary rounds). Against the finest relay teams in the state, the foursome carried that "stick" smoothly with Essien taking it to the line crossing in 41.67, the second-fastest time they've run this season. Their 6th place finish gave them "All State" honors. Remarkable ending to a story that went from "good to great" in a span of two months. Ryan Laudermilk found himself in one of the toughest groups of high jumpers assembled in some time. In fact, it would take a leap of 7 feet to finish in the top 3 of the Final. Laudermilk, who just missed a State meet berth in 2015, not only made the meet, but with a leap of 6-6 on Friday night qualified for the Saturday final. There he cleared 6-6 again but struggled at 6-8 and settled for a very respectable 10th place in the State. He'll be enrolling at Brown University in Rhode Island next Fall and intends to continue improving his craft in the Ivy League. Tyler Janes has made his final season in the King uniform one for the history books. With his future UCLA coach in the stadium looking on, Janes ran one of the fastest 1600-3200 combo races in the history of the State meet. The 1600 should be considered his "specialty" of the two distances, and it came first of the two in one of the deepest fields ever assembled at the State meet. No less than 5 of the top 1600 runners in the entire country were spiked up and ready to roll. (Tyler's 4:04.33 was the #10 time in the US, and he wasn't the favorite!). A tactical start took the field through the 800 in 2:06 and then the race was on! The group splintered with Janes in the lead pack as they dropped their pace down to a 62 second third lap then kicked at the bell. Janes' put down a 57.8 last circuit to cross in 4:05.86 but it was only fast enough to get him to third overall. Still, it was the highest finish of any King athlete at the State meet in our 17 years. Three hours later he took to his "secondary race" and even with a sixth-place finish, it may well have been his best race of the night. Again, side by side with many of the fastest two-milers in the land, he matched the moves and found himself in the top five (of 32 in the field) with a lap to go. There, the burn of the 1600 required its toll and a 61-second close wasn't enough to catch those who were on the track for the first time that night. Remarkably, he finished with an 8:56.93 time, the King All Time #2 behind Lane Werley's 8:53.21 set five years ago in the same State Final on the same track. Historically, the double Tyler put together was of elite status. Only three guys in the 98 year history of the State Championships have run that same double with faster times. In 2008, German Fernandez of Riverbank HS did the almost unthinkable, by going 4:00.29 and then 8:34.23, setting a national record in the process. In 1974 Rich Kimball ran 4:06.6 and 8:46 for the full mile and two mile. A few others have gotten close to the marks Tyler set down, but only two have eclipsed them. The fireworks exploding in the night sky after the final event, and hardly before Tyler could catch his breath, seemed to be a fitting way to end the season King Track and Field had put together in 2016. Collectively, the points scored by the relay squad and Janes in two events put King as a team in 13th place. The CIF Southern Section Masters Meet is a unique event in that it brings the best of the best from the bottom half of the state together on the same stage, head to head. In a section that has over 500 schools, to be counted among the top 12 athletes (top 9 in lane events) from a grouping of schools that large is a tremendous accomplishment. 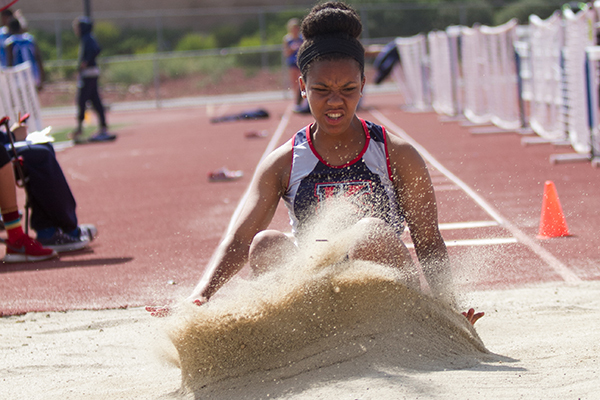 The meet showcases the best of the best from Southern California and serves as a qualifying meet to move athletes on to the State Championship, held June 3-4 in Clovis. Needless to say, competing on this stage requires composure and poise, and for the 7 King athletes who took to both track and field, those characteristics were on clear display. Courtney Klosinski was the only one who went home with some disappointment as her 8th place finish in the shot put kept her from moving on. Still, her toss was only two inches from her lifetime best and being the 8th best shot putter of 500 schools is quite a feat! The boys 4x100 squad of Saadiq Jennings, Jaylen Moore, Korey Parsons and Jonathan Essien were the story of the day. They were the 8th of 9 squads based on seed time and thus were given lane 9 - somewhat of a disadvantage as the field is entirely behind the team for most of the 400 meters. Jennings got off to a great start and by his exchange 100 meters in, he said afterward he sensed that he and Moore were handing off in the lead (indeed they were) and yelled "Go!". Moore did just that, screaming down the backstretch with only the eventual winners, Vista Murrieta, closing the gap. Korey Parsons ran a great second turn and handed to Essien who did his normal amazing anchor and brought the 8-seed team across the line in second place! Even more impressive was the 41.54 time, a full half-second faster than their previous best and put the new school record firmly into the middle of historically elite times. This team of three seniors and a junior are the first relay squad in King history to move on to the State Championships! Ryan Laudermilk missed that State meet last season as he came up just short of the day he needed in the 2015 Masters meet. This year was a different story as he missed not one attempt through the first three heights, capping out at 6-7. By that point, he was in second place and on to State. He'd finish there in second after three misses at 6-9. Second best in Southern California and State-bound! 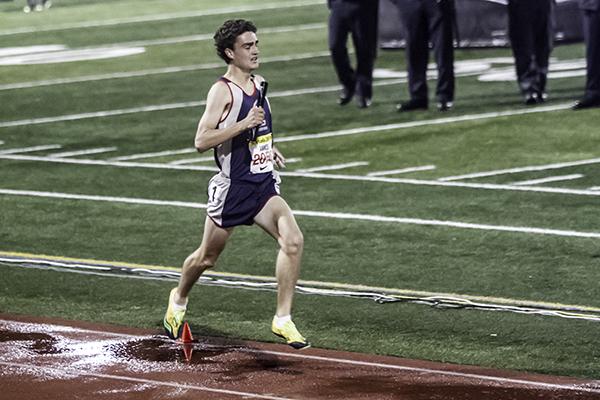 Tyler Janes, competing in both the 1600 and 3200 meters, did something no male athlete at King has ever done. He qualified for State in two events! The 1600 is his "main event" and there he ran a solid 4:08.81 for 5th place. In a field of 12 athletes, the Section showed it's depth and talent as every racer moved on to State having met the minimum qualifying time! In the 3200, Janes had to work a bit harder to finish 10th in 9:06, just slipping under the 9:07.63 standard. It was a masterful set of performances and set the stage for King to send the largest group to the State meet in school history. When Coach Corona took over the Track and Field program back in 2002, he instituted a motto that has guided the program ever since. Known as "The Three C's" -- Class, Character and Courage -- the program has stood for these values and they have remained unchanged; in seasons of great accomplishment and lesser, the Three C's have stood resolute. All three converged with great beauty and symmetry at the CIF Southern Section Finals on Saturday held at Cerritos College. The finals is a meet where only the best in the section and the division compete. It takes a fair dose of courage in the heart of a young person to not only walk out on that stage with confidence, but then to perform at a high level against field that includ no slouches. "It was a great day for the King program" said Coach Corona at the conclusion of the meet; after King had taken home six All-CIF distinctions, qualified six events into the elite Masters' meet and crown their first CIF Champion since 2004. And for good measure, the boys finished 4th as a team, a high finishing place King has never accomplished prior to this weekend. Indeed, a great day. The boys 4x100 team of Saadiq Jennings, Jaylen Moore, Korey Parsons and Jonathan Essien kicked things off with a sterling effort that brought them across the line in 3rd to notch the first All CIF honors (top 6 in each event) of the day for the Wolves. A couple less than perfect exchanges were made up for by Essiens incredible last leg as he moved the team from 6th to that third-spot with a last 50 meters that was simply stunning. 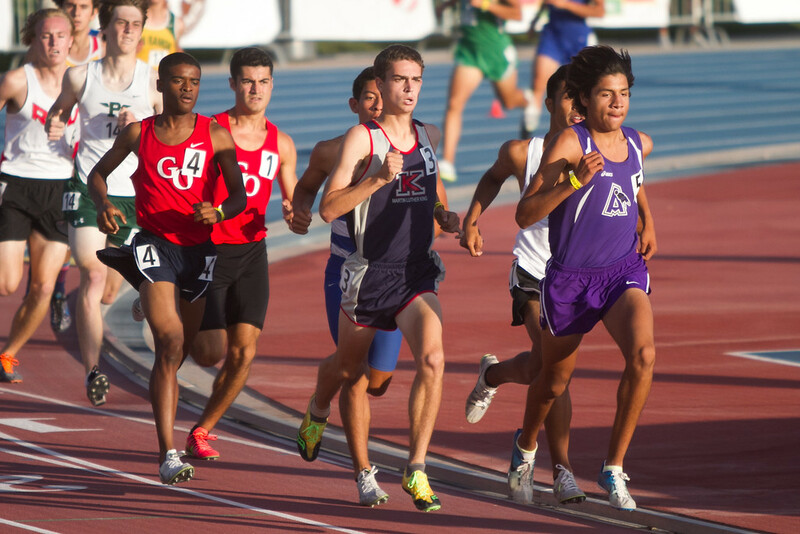 Tyler Janes was the next to earn an All-CIF accolade in the 1600 where he also finished third. A tactical race in which the field was content to run a "casual" first half-mile, turned into a sprint where Janes' 57.8-second final lap wasn't enough to cover the winner's 55-second closure and he'd settle for third in 4:09. Andrew Boebinger was also in the race, his first ever CIF Finals appearance in his great high school career, but he struggled in the race and finished in 4:32. Janes would return in 3200 meters at the end of the day, and despite having run the event only a few times, he uncorked a run for the history books. Patiently biding his time through six laps of the eight, he gradually moved into a top 3 position and on the final 200 put down the speed that's carried him to the national ranks in the 1600 and outkicked three hard-charging opponents to win the title outright in a time of 9:01.00. The title was King's first since Orlisha Henlon pulled it off in the high jump, 13 years ago! 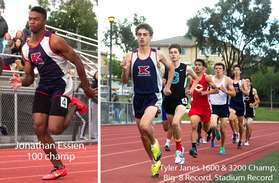 There have been a host of CIF Runners' Up finishers, but a long time has passed since a King athlete got to the top of the podium at Finals! In the field events, things went just as well. Sissy Underwood, used her first and last appearance at the CIF Finals to do really well. She matched her lifetime best at 17' 1.5" and finished 8th. Dante Anderson was in the triple jump where he launched himself to a new PR of 44-4.25! That leap was 5th place in the division and qualified him to move on to the CIF Masters meet as well. Ryan Laudermilk made the Masters meet in 2015, so this stage was a bit familiar to the talented high jumper. He had a very good outing, clearing 6-6 to finish 2nd overall. Perhaps better than that, he called attention to the fact that the judges of the event were about ready to award him a 4th jump when the max is three, having overlooked (or forgotten) about one of his earlier misses. One extra jump could have improved his position, but it would have done nothing for his character or integrity so he let them in on their error. That's class! Courtney Klosinski had another solid outing in the shot put. 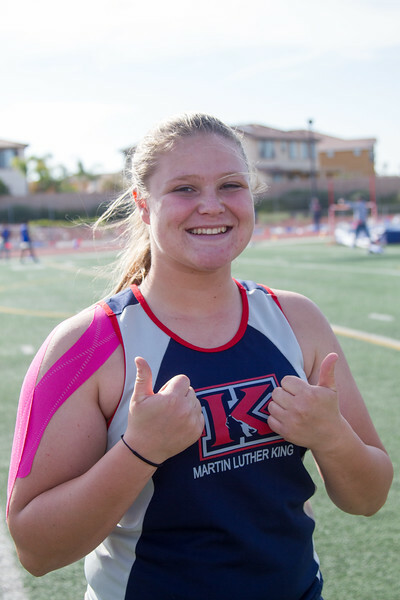 The school record holder didn't have her best throw of the season, but it was good enough and landed her in third place, yet another All-CIF honor on the day and another King athlete who will be in the Masters meet in the next week. Class, Character, Courage. They are great ideas to build a life upon. A track and field progam can be served just as well. They are the building blocks of great things and they've served King Track and Field well for over a decade now. For this one brilliant afternoon, all three attributes seemed to have been written in all caps, which made for a really, really great day to be King. Without question, qualifying for the CIF preliminaries in the Southern Section, Division 1 and from out of the Big 8 is no small trifling. Earning a place on this stage, held at Trabuco Hills High in Lake Forest takes skill, training and a sense of timing. But make no mistake, the point of the meet is to qualify for the NEXT round, the D1 CIF Finals held one week hence held at Cerritos College. For King Track and Field, that process showed King having a very good day as the program put through more athletes into Finals than we've had in some time. The boys 4x100 team led the way with yet another school record at 42.04, the third time this season they've eclipsed the SR. Saadiq Jennings, Jaylen Moore, Korey Parsons and Jonathan Essien were on their game and moved the baton swiftly and smoothly around the track and finished with the fourth fastest time of the day. After the 2015 version of this relay squad finished 9th at Finals, this group looks to be on the podium with a top 5 finish next Saturday. They are also have an opportunity to be in the top 9 relay teams of all four divisions combined, and if they are, they'll move on to another week of CIF and compete at the Masters Meet. Tyler Janes, who finished 8th in the State in the 1600 last season, punched his first ticket for a return trip to Clovis as he qualified in both the 1600 and the 3200. A nice advancement came from Andrew Boebinger who moved on to Finals for the first time in his career, also in the 1600. He was 9th and ran 4:18.
began his return to CIF with an easy 6-03 clearance. Dillon Lay had one of his best 110 high hurdle sprints ever to finish 11th and earn a spot as one of the two alternates on Saturday's Finals. Sarah Ann Frank also had a big individual performance but, in a nod to the depth and talent in the Division, was still 13th on the day. Alec Jones had a great two throws in the shot and discus, and while he didn't advance to next week, his season was an advancement. The junior rookie to the sport, started this season at 69 feet in the discus but ended at 144-09, just shy of his PR of 147. 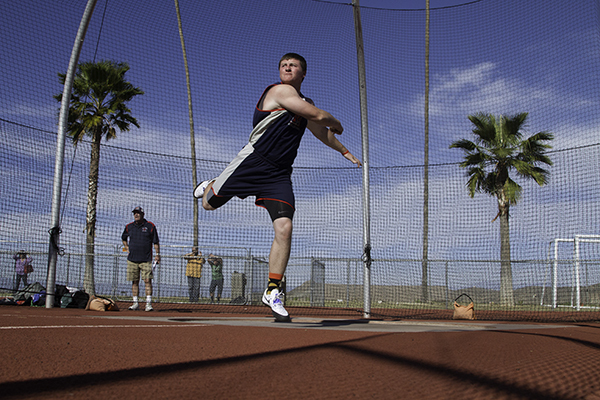 His shot put on saturday was his best ever at 47' 1.5". Sweet season! In the girls 1600, while she didn't qualify, Allison Janes battled nicely and finished very close to her lifetime best times. One of the more amazing stats on the day was Larissa Cesena running the 300 hurdles in 46.33, the KAT #5 time. Amazing, in that she's only been doing the event for one month! The strength and depth of Division One did what it does best ... it pushes. It pushes athletes to dig deeper and stretch for their best efforts. While that doesn't gaurantee a top 9 finish and a pass on to the Finals seven days later, it does become a good task master for all involved. 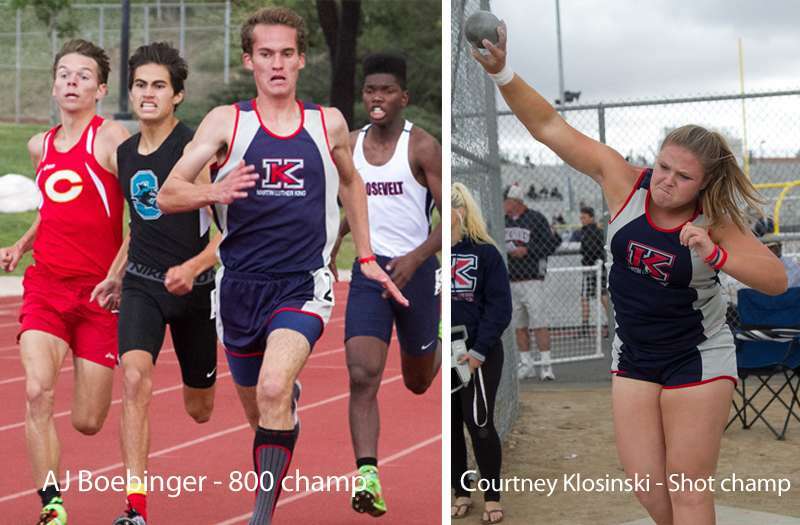 For a couple handfuls of King athletes, the push of prelims propelled them to the Big Dance, CIF D1 Finals, and that was the primary purpose of the meet. The 2016 Big 8 Track and Field Championship at King High was placed on the calendar over a year ago and held itself out as an opportunity for the Wolves to showcase their home, philosophy and program. All season long the meet loomed and the goal to "Go Big" grew closer. There was a definite sense of anticipation by all involved. Last night, under cool, cloudy skies and bright stadium lights, King played host to the Big 8 League and from all accounts, the guests felt welcome. But by the time the last baton crossed the finish line in the 4x400, it was clear whose "house" it was and how comfortable the King kids felt in their own home; hanging out and runnin' around in front of friends and family like they owned the place. So at ease were they, their performances sparkled. Of the 32 events contested, King will have CIF representation next week in 29 of them! Indeed, it was a great night for King to be what we aspire to be. No points are scored in the championships, as the team contests are decided during the dual meet season. But, had an invitational scoring system been in place, King's ladies would have scored 70 more points than their nearest rival. While King crowned only one league champion -- Courtney Klosinski in the shot put who punctuated her fantastic season -- there were so many 2-5 places that the impression was King's girls felt very much at home. For example, the 1600 saw King's girls fall in line behind Centennial's Rylee Penn who won easily, but King swept the next four spots. Allison Janes dropped a huge PR (personal record) to go 5:17, Lauren Peurifoy matched her PR at 5:19, Rebekah Pendleton PR'd at 5:21 and Kathryn Hammar was fifth at 5:25. With Alyssa Haring 2nd in the 3200, Peurifoy and Janes helped to clog up the victory stand in that race too. In the sprints, Tia Parrish and Sydney Reid were two medal winners in both the 100 and 200. Sarah Ann Frank and Larisa Cesena were both top finishers in the hurdle races, with Cesena breaking into the top 5 King all time in the 300's. Sissy Underwood, snake bit of sorts in the last two years of Big 8 Finals by finishing fourth and missing CIF by one place, finally broke through with two qualifying jumps, going 2nd in the long jump and third in triple. Gabriella Sanabria was the runner up in the triple going 34'10. Jayda Gainer was fourth. Both relay teams finished in 2nd. In the shot put and discus, behind Klosinski's heroics, Elizabeth Curtis had a huge day. She PR'd in the shot to place, and at 36' 6", she has improved over six feet in just the last two weeks! 9th grader Kimberly Garza medaled in her first ever Big 8 Final! Nice! Lots of smiles and good times were had as the King kids romped through the two-day meet and demonstrated who owned the house. Their male teammates did likewise. Just like the girls, had a score been kept, the King boys would have won on their side of the ledger by almost 70 points. They did it not only by filling up the victory stand with multiple scorers, but with a handfull of league champions as well. Tyler Janes had a fantastic last day at home before he heads off to UCLA. Five years to the day after King/UCLA alum Lane Werley set the stadium record in the 1600, Janes put his own name on that list with a 4:14.60. He came back in the 3200 and took another victory. Somewhat overwhelmed, he described to a reporter for the Riverside Press Enterprise that his emotions were due a sense of "God's grace, to be honest. Just to get to be at (league) finals my senior year, at home, it's just grace. I kind of get emotional, thinking about it. It's my last time here. I'm happy I got to go out with two wins. It's a blessing for sure." Ryan Laudermilk's stadium record in the high jump may have been a lesser noticed accomplishment as it came early in the day before the track events began. Sill, the high-flying, 4.8 GPA scholar who's headed to Brown University next Fall quietly put together a series of historic proportions as he erased six names that were log-jammed at 6-6 on the all time list on this field, upped his personal best by an inch and got just a little closer to the school record of 6-8. Dante Anderson launched himself to the victory in the triple jump. Mohsin Sabrin had a stellar 400 meters as he came storming from third place over the last 100 to win in 49.97. Jonathan Essien, a part of the winning 4x100 squad that included Saadiq Jennings, Korey Parsons and Jayden Moore, came back to win the 100 in an outstanding 10.87 without any aid of a tail wind. Impressive stuff, that. Andrew Boebinger who will be heading off to the Air Force Academy in about 8 weeks made his last few jaunts around the home track meaningful. He shadowed his buddy Tyler in the 1600, crossing the line in 4:18 and second place. Then, in what became one of the most exciting races of the night, he got into an old-fashioned foot race in the 800 as five guys hit the final stretch almost side-by-side. AJ, perhaps showing the chops of the fighter jets he hopes to fly someday, kicked in the after burners and sped home for the win. Places 2-5 were 1 second apart! He came back to help Mohsin, Blake Gelinas and Jennings take the third spot in the 4x400. On to CIF they go! Like the ladies, the guys made the victory stand at mid-field look a bit like a stairway just a few steps from their front door. Making their way up the gloried steps and looking comfortable doing it were a host of King athletes. Markel Wells was third in the triple behind Anderson; Anderson took third in the long at 22-0 and Ricky Gore was 5th there. Andrew Wilde and Noah Poole were medalists in the vault, Tyler Navarro was 4th in the high jump, Alec Jones medaled in both the discus and the shot; a PR of 46-3.5 was gained in the shot. Brad Garza also placed in the shot. Dillon Lay and Josh Fisher climbed those steps twice after both hurdle races; Lay was 2nd both times. In the 3200, Daniel Gonzalez was third to punch his ticket to CIF for the first time. Essien and Moore added to their haul of hardware in the 200, and with Saadiq Jennings joining them in the 100, King put three guys on the victory stand in the 100. Most folks feel comfortable in their homes. It makes sense; it's where ythey live and play. For hundreds of Big 8 athletes from across Corona, they came to King's house in Riverside and had a good time. King did everything they could to make their guests feel welcome, but by the end of the meet there was little doubt as to whose house it was. After the big time win last week against the Roosevelt Mustangs - a team that hadn't lost a Big 8 meet in the entire history of the league, all King's boys had to do to clinch the 2016 Big 8 League Title was finish out the season against Corona High with a win. That victory came easily for the boys and by the time the sun had set, King's boys had earned their first-ever Big 8 league title and the first league title since the school's Ivy League days back in 2008. The meet did not provide the pyrotechnics of the Roosevelt dual and the unhurried pace and effort throughout the afternoon by both teams were like the falling embers of spent fireworks; pretty to look at but the boom was gone. It was an anti-climactic ending to what was really a fantastic season in which King's boys lost not one meet. A fade, but nonetheless effective. For the girls, their season ended just two points from a league title. Like the boys, the match up against Corona was anticipated to be a decent battle, but that conflict never manifested itself and King found itself pulling some of its athletes from events as the outcome became a foregone conclusion. 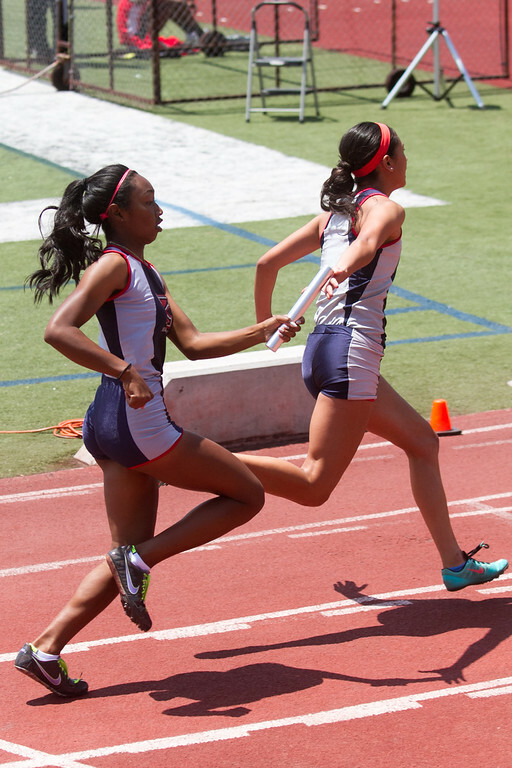 To point, the girls 3200 and both 4x400 relays were not contested. But two points against a talented group from Roosevelt is as near to victory as a team can perhaps come and still fall short. It was a bitter pill to swallow, but does not diminish the effort the ladies of King put forth all season despite injuries to key performers and the wearing grind any season can be. What is left is the League Championships, to be held next week at King High. The team contests have been decided and what is left is a showcase of the best the Big 8 has to offer. Many of those will be wearing the King uniform and the Championships will be a stage, once again, for King to demonstrate class, character and courage. "It was a phenomenal, team program win tonight" said Coach Corona at the conclusion of the annual rivalry between King and the Roosevelt Mustangs. Words aptly spoken as it took a full-team effort for the boys from King to finally hand Roosevelt's boys their first-ever dual meet loss. From the opening relay, to the conclusion of the pole vault, every corner of the track and field contributed to the win. While the girls lost, the two-point margin between the two teams made for a wonderfully competitive and spirited battle despite the sliver of daylight that separated the prospective League Champions from the Lady Wolves. 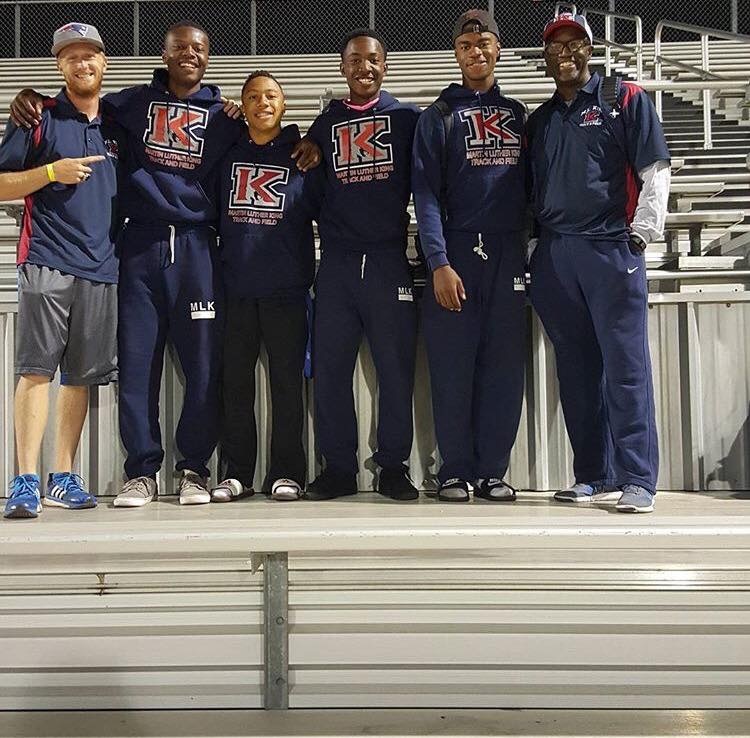 King's boys 4x100 victory made many eyebrows rise and had both coaching staffs admitting, "we didn't plan on that". That, being, King's squad winning by a couple of steps and that, being, King's time of 42.11 setting a new school record. But it was an auspicious beginning to a battle that on paper looked to be very tight throughout. Tyler Janes and Andrew Boebinger were next up and scored 8 points by finishing 1-2 in the 1600 and having to work to do it, running 4:20 and 4:23 -- much faster than would be necessary in most dual meets to earn a win. But the meet was two events in and already King's Pack was grabbing points in chunks. Other points came at the margins and Roosevelt's talented squad would win many other events, only to see their advantage minized by King's second and third place finishes. Dillon Lay and Josh Fisher went 2-3 in the 110 high hurdles after Roosevelt borrowed their standout 300 hurdlers Anthony Easter to run the 110s for what is apparently the first time this season. Easter won, as he did again in the 300's but Lay and Fisher's 2-3 there kept King close. Jonathan Essian blasted out of the blocks in the 100 dash, finishing second but ran a new school record of 10.60 in the process. That effort and a sizable tail wind pulled Saadiq Jennings along to a PR and KAT #3 at 10.85. Second and third place, again, combined efforts that kept the Pack circling. in the 800, Andrew Boebinger ran away from a herd of Mustangs. It was a battle though, as he and three from Roosevelt were side by side with 300 to go before Boebinger surged to an impressive win and his 8th point on the day. In the 200, a faulty set of blocks had Jonathan Essien slip and fall at the gun -- the race was not called back as the starter didn't see it -- but Korey Parsons stepped up to score in second. The Pack, it would appear by this point, had more Wolves imbedded in it than previously seen. The 3200 had Janes and Daniel Gonzalez shadow Roosevelt's talented sophomore, Raymon Ornales, the reigning Big 8 Champion in cross country. For over six laps the two sat and waited until the move was made with 500 meters to go and it was strong enough that the two gained 8 points for the cause and ran lifetime PR's and KAT's #2 and #3 times at 9:19 and 9:20. The field events contributed in no small way. 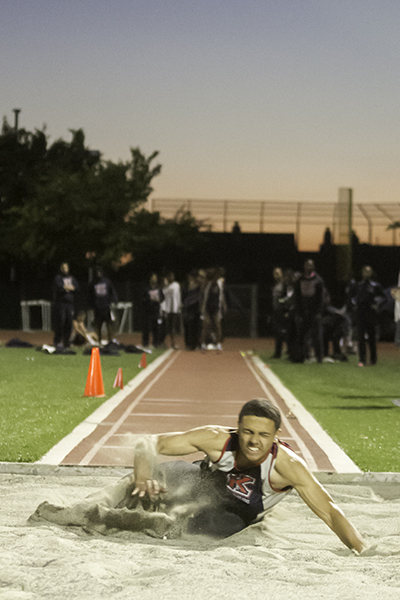 A loud cheer erupted from the long jump pit as Dante Anderson, locked in a tight match with Roosevelt's Jordan Manier, leaped out to 22-11 and figuratively leaped over 5 of King's all time best to land with a new school record. Dante had never even surpassed 22 feet before this big flight. Not to be outdone however, on the very next leap, Manier had his teammates cheering as he landed over 23 feet from the board to set their school's all time best. But true to form, Ricki Gore for King was third and despite the fireworks in the event, Roosevelt edged King by only one point. Alec Jones and Jacob Melton went 2-3 in the discus while Jones and Brad Garza took 4 points in the shot. Andrew Wilde and Noah Poole were 2-3 in the vault; Ryan Laudermilk won in the high jump with Jordan Murray taking third. And so there it was, a "program win" as the talent, depth and spirit that has been nurtured by the coaching staff and community won the day and sets the boys up for a run at a League title with only Corona High School in the way. For the girls, while victory wasn't tasted, the effort put forth was truly victorious all through the afternoon. Allison Janes and Lauren Peurifoy were 1-3 in the 1600 to get things going after the team lost the opening 4x100 relay. Tia Parrish returned nicely from injury with a 2nd place finish in the 100 and 200 meters, and Sarah Ann Frank kept King close in both hurdle races, placing twice, despite Roosevelt's renowned hurdle aces they produce annually. A big push in the right direction came from the throws, as King swept both of those events, earning 18 points in the process. Amanda Sosa and Jessica Ferguson were consistent in the 800 and crossed in 2-3, while Alyssa Haring and Peurifoy ran very tough 3200's to go 1-2 there. It would have appeared that Roosevelt's Paloma Barron was set up to take third as Allison Janes was some 20 meters behind her with 150 to go, but Janes dug deep to finish the King sweep. Sissy Underwood and Alyssa Drake battled ferociously in the long jump finishing in 2nd and 3rd; Drake spraining her ankle in the process which kept her out of the triple jump leaders. Gabriella Sanabria and Underwood went 1-2 in that event to keep King in the match. Despite the narrow loss for the girls, the meet was truly entertaining. After a number of "blow outs" during the early weeks of the season where both squads gapped weaker opponents by 70 or 80 points, King met their match, finally, in the form of the Mustangs from Roosevelt. The back and forth nature of both contests was truly entertaining and proved the truism, that win, lose or draw, competition will make you better. With three school records, multiple season and personal best efforts by many on the day, King won't need much convincing. The Mustangs are a talented bunch, but on this day, they got all they could handle from a pack of Wolves. With the Big 8 league powers Roosevelt and Corona looming on the horizon - Roosevelt is next week - the Norco meet at King proved to be a calm and comfortable track meet that allowed King to win on all four levels with relative ease, despite resting many of the normal scorers at the varsity level. That respite was perhaps a welcome one for the athletes before the strong winds of competition blow in from the other parts of Corona and present the final challenges to the conference schedule. Despite the conditions, many King athletes had a fine day. Cardell Walker had a lifetime PR in the 400, going 53.95. Blake Gelinas, normally a 400 runner, moved up nicely and took second in the 800 meters, a race he's never run before, but he crossed the line in a solid debut at 2:07.15. Jefrey Ortiz had a fun PR in the same event, now ten seconds faster than where he started at the beginning of the season. Garrett Vasta had his best-ever mark in the 3200. Dillon Lay had his fastest time ever in the 110 hurdles that wasn't wind-aided, going 15.24. In the shot, Alec Jones had his lifetime best in the shot put, throwing it 45' 7.5" and he doubled the feat by throwing his best ever in the discus. Freshman Jordan Murry won the high jump with a personal best of 5'8". Larissa Cesena had a good run in the 200, an event she doesn't do that often, crossing the line in 27.24. That was the backup race to her lifetime best of 15.80 in the 100 hurdles that earned her a second place finish behind Sarah Ann Frank. Jasmine Jimenez had two lifetime bests in both hurdle races! Allison Janes ran her season best in the 800 at 2:30, showing that a nice second half of the season is opening up for her. Lauren Peurifoy was right there with her and had her lifetime best at 2:30.88. Kathryn Hammar ran tough in that race also, and put down a 2:31, her best of the 2016 season. Allison would return in the 3200 to drop her first ever race at that distance and recorded a fine, sub 12:00 mark. In the throws, Liz Curtis improved her lifetime PR out to 97'-plus in the discus, just 17 feet farther than she started the season at! Nice! Jayda Gainer and Treasure Rucker had lifetime PR's in the triple jump, while Gabby Hasemeyer had her best-ever time in the high jump at 4-6. So despite the lack of sharp competition, the teams performed well and well enough. Whatever, the big storm is coming next week in the form of Roosevelt and for good measure, Corona to conclude the season. The calm before those storms may be nice, but it won't last long. When Tyler Janes crossed the finish line of the Distance Medley Relay (DMR) on Saturday night at Arcadia, he threw up both arms in celebration. They formed a pair of exclamation marks at the end of a thrilling, come-from-behind victory that he, Daniel Gonzalez, Mohsin Sabrin and Andrew Boebinger put together, earning an upset win over several ranked and favored teams from several states. Their time of 10:12.89 set a new school record and is #2 time in the nation this season. Under the lights on Saturday night at Arcadia is arguably the finest moment of any season for any high school track and field athlete in the country. Literally dozens of "national leading" or "nationally ranked" marks are recorded at Arcadia and for good measure a handful of state or national records are set at the esteemed meet every year. For the four horsemen from King, this was a big stage that they performed exceptionally well on. Daniel Gonzalez led off and after three laps, he handed to Sabrin about mid-field of the 24-team race. Sabrin held his position for his 400 meters, then gave to Andrew who was 24 hours removed from the stomach flu but took the stick from 9th to third over an 800 meter leg he covered in 1:56. Janes calmly took three of his four laps to catch the leader and ran away with it on the last circuit to the upset victory and a memory for the group and the King program that will last for some time. That kind of solid, hard effort was displayed by the King contingent throughout the two-day event. When Coach Corona was asked what he thought of the efforts of his team, "Solid" was the first word that came out. Despite raining, inclement weather which created anything but ideal conditions and a bit of a Spring Break hangover, the Wolves battled and preformed admirably throughout what is generally regarded as the biggest and best high school invitational in the country. On Friday night, Dante Anderson, fought through the rain; a wet runway and a soggy pit to place fifth in the Boys Long jump at 20-8.5 inches winning a medal for his efforts. Both boys and girls 4x1600's also did well. The girl's team of Allison Janes, Amanda Sosa, Lauren Peurifoy and Alyssa Haring ran very well despite their youth (only Alyssa is an upperclassman) while the boys, absent the services of impaired Boebinger, put together a fine effort. Mark Werley, Michael Robinson, Gonzalez and Janes all raced near their PR's. On Saturday, the boys 4x100 comprised of Saadiq Jennings, Jaylen Moore, Jason Gonzalez and Jon Essien put together a 43.5 mark finishing fifth in their heat while the girls team (Anna Barry, Charizma Guzman, Larissa Cesena and Sydney Ried) recorded a 50.0. Ried moved her team from 7th to 4th on a strong anchor leg. Dylan Lay in his first individual foray at Arcadia (he was on the shuttle hurdle championship team last year) went 15.58 while Essien came back in the 100 and with his typical strong finish nabbed second place at 10.9 . Ryan Laudermilk tied for fifth in the high jump against steller competition. The girls distance medley team of Allison Janes, Maryjane Smith, Jessica Ferguson and Lauren Peurifoy were very competitive in their efforts. In the day-portion of the meet, the girls DMR of Janes, Maryjane Smith, Sosa and Peurifoy raced very well and at 12:46, ran the sixth fastes DMR in school history. Seven hours later, the boys DMR took the stage, punctuating brilliantly what had already been done very well by whole group. An invitational the stature of Arcadia can leave many young people shaking from the perceived pressure. For many others, it's a stage to be taken by storm and punctuated with excellence. On this wet weekend, King got to see the latter by many of this year's best and the final race was the thrilling finish to an exceptional weekend. For the host school, winning the Frosh Soph Classic hasn't ever been a given but right from the start of this, the 12th annual event, the King Wolves were able to establish early points and move steadily away from all pursuers. On the girls side it was Serrano that finished closest in second place and on the boys side it was Rancho Verde, but on both sides of the gender divide King won handily. King's girls won the first event of the morning, the 400 relay with a 51.09 mark and never looked back. Lauren Peurifoy won two events, the 1600 and the 3200, scoring 10 points between them. She was shadowed by teammate Amanda Sosa who finished 3rd in the 1600 wth a lifetime best of 5:20 and 2nd in the 800. Also in the 1600 was Allison Janes in 6th who ran a lifetime PR of 5:25 making that race an exciting one for all involved. In the half-mile, Murrieta Valley's Paige Seigal ran away from the gun and closed with an impressive 2:24. She'd come back in the 3200 and finish third to score nicely on the day for the Nighthawks. In the hurdle races, Sarah Ann Frank was a double winner. In the 300's she ran 1/1000th off her lifetime PR. Serrano's Sandra Arteago was the runner up in both races as well while Kaleigh Giannone was third in both, making it a unique double sweep for the three ladies. King's Sydney Reid had a very fine day helping to win the 400 relay while dashing to victory in both the 100 and the 200 sprints. Natalie Lin of Serrano won the triple jump by over 3 feet and for good measure won the long jump by 7 inches. Ashlyn Blotzer of Santiago soared above all other in the high jump, clearing a very impressive 5-4. In the vault, Madison Kast of Murrieta Valley was over a foot-and-a-half better than the nearest competitor and won easily clearing 10-00. Kimberly Garza of King won the shot put with a throw past 32 feet while Brittany Everly of Santiago was able to just nip Garza in the disc, winning by a half-inch over her King opponent. On the boys side, Rancho Verde's sprinters had some really nice showings through out the day, but that's nothing new for the Moreno Valley school. 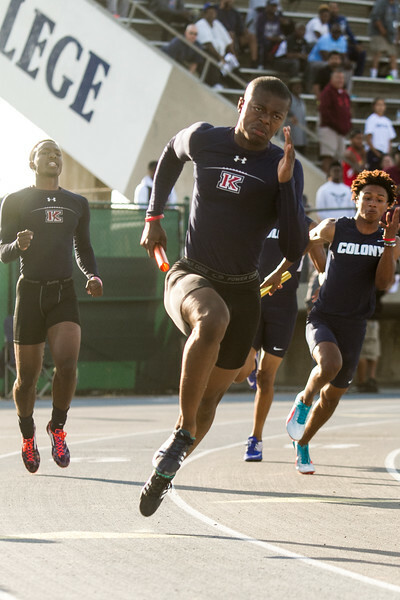 In fact, in the 100, they finished 2-3-4 with Jamar Simpson, Chandler Owen and Jasiah Richard-Lewis doing the honors there, then in the 200 coming back with Richard Lewis finishing 2nd behind James Phillips of Heritage who took the victory. King's young distance team scored well in all three multi-lap races. 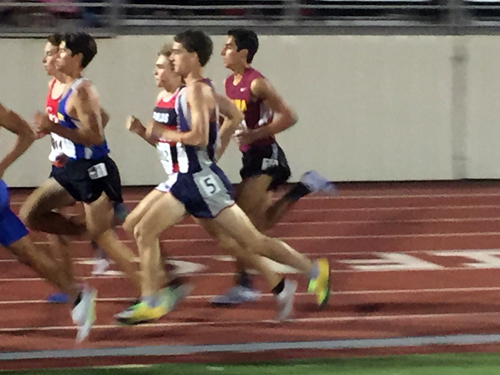 In the 3200, Jonathan Moncada, Aman Rana and Chris Barba pulled away from the pack mid-way and went 1-2-3. Garrett Vasta, Rana and Barba also scored in the 1600. In that race, Marcos Milla of Santiago-Corona was the winner and just behind him was Humberto Gonzalez second. Gonzalez would win the 800 in a time of 2:03. Rancho Verde swept both the boys and the girls 4x400 races. Santiago's Darney Smith won the long jump at 19-10.5, Valley View's Sidney Robinson would take the triple jump by over 2 feet beyond his nearest opponent. In th ehigh jump, Jordan Murry of King would win with a leap of 5-6. Brandon Forbes of Serrano took the vault victory with a clearance of 12-0. In the shot, Santiago's strong man, Silas Hurst tossed it 49-8 and crushed the discus competition by almost 20 feet, throwing the disc 145' 5". Incredible. King's two victories were by a large margin, but the competition and the quick pace of the meet was a good stage for younger athletes to shine on. And that's the pupose of the event, to build a stage that tomorrow's stars could shine today. Beaumont High School rolled into town with the complimentary intent of competing against King. The growing Beaumont school has long been a smaller division team, but with increased numbers and a wise and competitive coaching staff, they came to town to up their game. "We wanted to compete against big schools like King for some time so we can begin to put away that 'small school' mentality", said their head coach prior to the first event. And so in the Cougars came with their talent, breadth and effort which spurred King to victories earned by working equally hard and demonstrating a collective sense of teamwork that has been missing in strong doses all season. The ladies' contest was the closest King has had all year, and was highlighted by Courtney Klosinski's school record in the shot put. Her throw of 39' 3.25" was 2 feet beyond her previous best and surpassed Anissa Claiborne's old mark of 38' 7.5" by 8 inches! The team battle was a good one as King lost both relays and were swept in the 800, an occurence that doesn't happen very often! That tenacity by an opponent was good for King's girls team and brought out not only Klosinski's record-setting marks but quality efforts throughout the afternoon. Sydney Reid had her best mark of the year in the 100 going 12.73. Larisa Cesena improved on her KAT 5 mark in the 100 hurdles, with a 16.04 time. Jasmine Jimenez in the 300 hurdles ran her best ever mark at 50.1. In the shot, Courtney's school record effort was matched by a PR from Elizabeth Curtis who threw it 31-6, her best ever. Areena Zavala had her best-ever discus throw reaching out to 94-11. The boys had a run-away victory, winning by a large margin. Andrew Boebinger had a very solid double victory in the 1600 and 800, pressed by Beaumont's talented distance crew. After running the KAT #3 1600 on Saturday night at Azusa Pacific, Andrew had to dig down here in a dual meet and to earn a 4:25 victory. He came back and went 2:00.38 in the 800 to win there too. Jonathan Moncada had his best time ever in the 3200 at 10:17, scoring for the cause. Korey Parson PR'd in the 110 high hurdles, Jaylen Moore took the win in the 100 meter dash in a near-best of 11.84. In the discus, Alec Jones had a throw that was almost 10 feet beyond his previous best, landing it at 121-5! Dillon Lay and Rick Gore both PR'd in the long jump. Perhaps the best sight of the day came in the 4x400 relays as both full squads (and Beaumont had large numbers) lined the track - King on the home stretch, Beaumont on the back - to cheer on loudly their respective teams in the final event of the meet. It was a scene we've never witnessed in King's 17 year history and was a picture of the spirit that embodies team-oriented high school athletics. The meet was a first for the two schools, and while Beaumont may not have gotten the victory they were looking for, they certainly pushed King and together the programs got a better insight into what good track and field looks like. 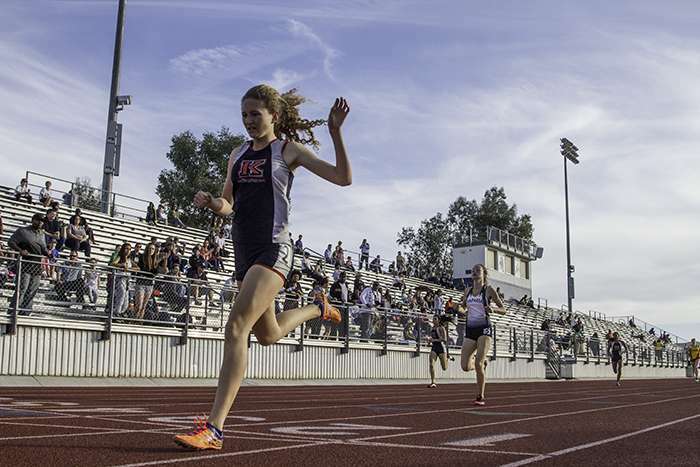 The annual Arroyo Distance Carnival held at Azusa Pacific University saves the best for last as the marquee "rated" and "invitational" heats of the dozens of 800, 1600 and 3200 races contested throughout the day go off after the lights go on. For each distance, the fastest two heats are electric as many of the state's fastest distance runners converge for incredible races before a packed stadium and accompanied by a stellar play-by-play announcer. 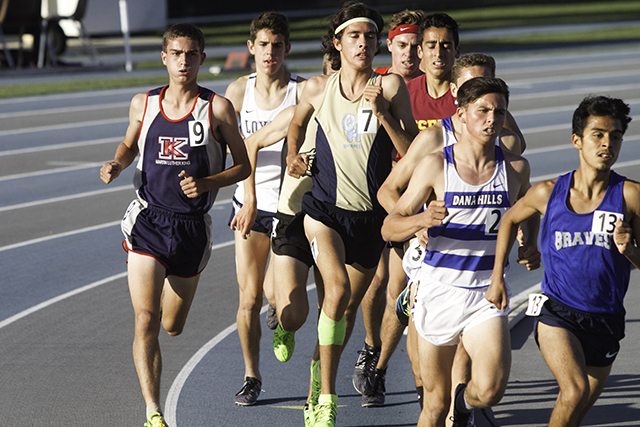 Tyler Janes, 8th in the 1600 meters last year at State, entered the invitational mile (1609 meters) on that big stage along with most of the very best that California has to offer this season, including Austin Tamagno, the defending State Champion. The field took it out fast and Tyler crossed the 800 split in 2:00. On the backstretch of the last lap, Tyler took the lead of the race and held it until the final 100 when he was passed by three. He finished fourth, but his 4:05.97 set a school record (Lane Werley's 4:13 was five years ago to the day), a Riverside County record and was the fourth fastest time in the nation this season. In fact, his bold move helped drag 11 guys in the race under 4:11.00 ... an incredible display of the depth California has to offer in the event. But his was only one part of an amazing day for King's distance runners. Andrew Boebinger preceded Tyler in the rated heat and AJ impressed with his own incredible race going 4:16.47 for 1600 meters, finishing third and also inking himself third on King's All-Time (KAT) list. He is also sitting in the KAT 2 spot in the 800 with a 1:55 last season. Also under the lights were Mark Werley and Daniel Gonzalez in the rated and invite heats of the 3200. Both guys were doubling off PR's run earlier in the afternoon in the 1600 meters, but came back with great strength and poise to run two more personal records. Mark's 9:42 is the KAT #8 and Daniel's 9:22 is the KAT #3. It was a day for PR's as the squad ran incredible well from the very beginning and kept it going through the 15 hour day. Skylar Smith's amazing PR in the 3200 at 7:20 AM started it rolling and the marathon of records lasted the entire time. Alyssa Haring notched the KAT #7 in the 3200 with an 11:14 effort. Freshman Lauren Peurifoy went 11:21 in the same race to post King's #2 fastest freshman time in that distance all time. She'd duplicate that listing in the 1600 later in the day going 5:20. Aman Rana was another double-PR with an incredible 3200 of 10:07 then a 1600 in 4:48.95, an 11 second drop off his previous best. Eric Soholt and Wyatt Smith ran the 800 with aggressiveness and skill, both putting great PR's together in the early hours of the meet. Garrett Vasta ran 2:08.77 at the same distance, just missing the #7 spot on the freshman KAT list. Alvin Agatep PR'd there as did Amanda Sosa who, at 2:25.90 is now at the 4-spot on the 9th grader KAT list. Jessica Ferguson really sparkled in the 800 as well, running a season best after a recent bout with illness that hindered the early season training. Sophmore Carissa Avila and freshmen Roman Hernandez, Tony Lorenz, Daniel Wilbert, Isaiah Cunningham, Matthew Castro and Dathan Chann all PR'd. Junior Austin Adams had his best ever time as did Sydney Grossi and Emily Arteaga. In the 1600's, of which there were over 50 heats(!) King's kids ran very well. 19 of the 21 who raced the distance came home with a lifetime best! Guys who had really big drops in time were Jacob Call, Mathew Castro, Michael Robinson and Daniel Gonzalez who at 4:22 became the KAT #6 runner. David Huff doubled and looked good in both the 1600 and 3200; getting very near his best marks all time. Jacob Mitchell had a 5:04 PR in the 1600 which was about 10 seconds faster than his previous best. It's hard to know exactly what it is about this meet that yearly pulls from the King runners the best of results. At night, under the lights, you could pin it on the "electric vibe" of the night and the elite competition. But to say that is to ignore the amazing results that come in the middle of the day, under the sun. We do know however, that King's marathon day in Azusa may have ended with the headline-grabbing run of Tyler Janes, but it had equally interesting stories of dozens of kids who wrote their own headlines of their own special accomplishments that made the beginning and middle of the day just as much fun as its ending. On paper, or at least on the internet, the dual meet between King and the Santiago Sharks appeared as if it may be the closest meet of the year with a strong opposition lined up - especially on the girls' side. During the early minutes of the meet even, one of the Santiago coaches could be heard telling one of the members of their team, "We're doing much better than last year." And indeed the Lady-Sharks did just that and the battle between the teams was a lively one. It was also one that King was able to pull away and win at all four levels. As stated, the girls got the closer of the competition as the Sharks were within 20 points of the Lady Wolves until the very end. In a season where King has gapped their opponents by 80 points, 20 was an unusual margin. But the team prevailed with solid efforts everywhere. 9th grader Kimberly Garza won the discus with a toss over 90 feet and enjoy "center stage" as the discus event was brought into the infield of the track, a rarity. Alyssa Haring won the 3200 meters, while Sarah Ann Frank took victory in the 300 hurdles -- with a bit of redemption tossed in as she stumbled over a hurdle in the 100's and gave up what looked like a sure win there. Ashley Chruszcz and MaryJane Smith went 1-2 in the 400 and both relays won. The boys enjoyed a comfortable run away win, led by Tyler Janes who scored 10 points combined in the 1600 and the 800. He was pressed in the 800 by Kyle Pendleton of Santiago and had to run a PR and the KAT #5 at 1:57.68 to win. Daniel Gonzalez took second in the 1600 while Austin Dai, Jonathan Moncada and Aman Rana swept the 3200. Like the ladies, both relay teams were victorious. Dante Anderson was jubilant upon his 21-3.5 leap in the long jump that landed him in second there. He'd go second in the triple as well. Dillon Lay and Joshua Fisher were scorers in both hurdle races. Jonathan Essian had his second-best performance ever in the 200, winning at 22.19. Finally, Mohsin Sabrin won the 400 in a PR of 50.57, bumping Coach Vasal from the KAT5 list, and placing himself in that fifth-best all time mark! Both teams remained undefeated on the season and again by large margins despite what the prognostications seemed to say in the lead up to the meet. The Wolves surpassed the century mark in the points column against Centennial High yesterday in a fast-moving and relatively easy Big 8 leage meet on Thursday. The rapid movement from event to event made for a 3 hour time span from the first to last gun and along the way, all four King teams at both levels cruised to victory. Courtney Klosinski continued to amaze in the shot put ring as she notched another PR and put her already KAT third-ranked mark within a foot of the school record. Danielle Abboud won the 400 with a 62-second split, while Charizma Guzman took victory in the 200. 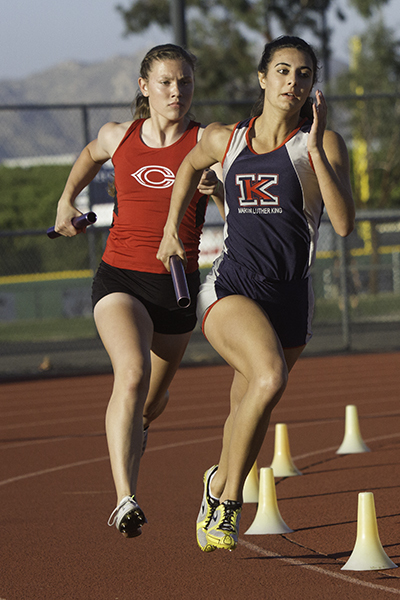 In the 800, King was privieged to host the reigning State meet runner up, Centennial's Rylee Penn. Admittedly the speedy sophomore was in "training mode" as she sets her sights on the State meet in June, but that didn't keep her from running unpressed to a 2:16:70, good for King's stadium record. She'd come back at the end of the evening to carry a leg on the 4x400 and help the Huskies to a victory there as well. Impressive! King's Lauren Peurifoy took two victories, in the 1600 and 3200, while fellow freshman Amanda Sosa ran a sweet little PR in the 1600 to finish second. Sarah Ann Frank was another double winner on the day in the hurdle races. On the boys' side of things, King was equally unchallenged in almost every event. Daniel Gonzalez impressed with a lifetime PR in the 1600, going 4:33.32. He'd double back with a controlled effort in the 3200 to finish second. Phill Griggs won the 400 and Mark Werley moved himself into the 800 and impressed there with a PR and a win. Dylan Lay scored twice in the hurdles, while Alec Jones, Marcos Gonzalez, and Terance Thompson swept the shot and Tanner Sebastian and Jacob Melton went 1-2 in the discus. So it was a day where the team had an opportunity to cruise a bit while racking up a lot of points. Enjoy it now, for most of the rest of the Big 8 teams -- including the Sharks of Santiago next week -- will pose a much larger challenge. The girls 3200 was the first event of the day of the Rancho Bernardo Invitational and it saw Alyssa Haring lead for much of the race before finishing in 4th with a season-best time. 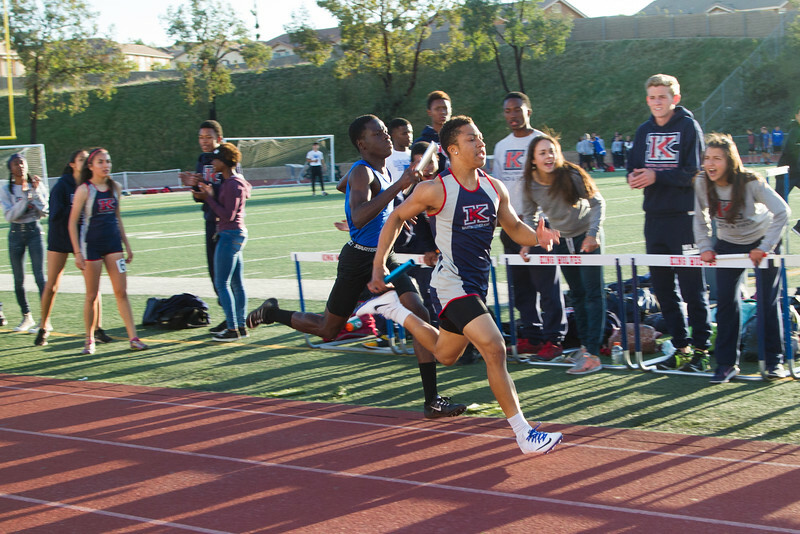 The next two events were the 4x100 relays in which the King girls and guys won. That early showing of talent by some of King's elites on a San Diego track where King was the only out-of-section school competing, led the meet announcer to playfully remark that King "wasn't being a very good guest". It was a jovial statement that was backed by the host school's head coach who said to Coach Corona at the end of the day that the Wolves had "impressed him each and every year as solid competitors and great kids that embodied a true team." In a sport that can easily lend itself to selfishness and a cancerous case of individualism, such a comment was decidely encouraging. That team element was on display throughout the day as the King kids showed a remarkable spread of accomplishment across both the track and the field. Daniel Gonzalez won the 3200 meters in 9:26, while Mark Werley ran a lifetime PR of 9:53. Jonathan Essien helped the relay team to a season-best time and victory then came back in the 100 meters and finished in 2nd there, by 1/1000th of a second! Saadiq Jennings was third in the same event. Andrew Boebinger finished runner-up in the 1600 where his 4:21.71 split put him 4th on King's All Time (AT) list. Garrett Vasta was fourth in the freshman 1600, and dropped an incredible 4:43.02, the 6th fastest KAT 9th grade mark. The boys 4x400 team of Joshua Fisher, Jeremy Young, Blake Gelinas and Mohsin Sabrin ran 3:28 to snag second place. In the field, the boys team had just as fine a day. Ryan Laudermilk won the high jump with a 6-5 clearance, and just missed at what would have been his PR at 6-7. He's off to a fine start this season! Jacob Melton had a very good PR in the discus varsity finals, throwing it 133-06. Carson Walder was 3rd in the long jump open flight with teammate Ryan Bardin just behind him in 5th. In the triple jump "invite flight" Dante Anderson would finish 4th wiht a mark of 41-02. The ladies had just as good a day. Tia Parrish and Sydney Reid went 3-5 in the 100 meter dash. 9th grader Lauren Peurifoy had a stellar day. She took third in the freshmen 1600, matching her season and career best of 5:27. The next event on the track - no more than 15 minutes of rest for the miler - was the distance medley where she ran another 1600 to anchor and did it in 5:30 ... moving up three spots to take the victory after Rebekah Pendleton, Valentina Sanabria and Kathryn Hammer all contributed mightily to put the team in the hunt. Sarah Ann Frank had a very good day hurdling, with a 4th place finish in the 100 and a third place finish in the 300. Larisa Cesena in the 300's ran 16.18 and dropped an 11-year old mark of the KAT5 list, making her the 5th fastest 300 hurdler in school history! Not bad considering one of those ahead of her is Frank, and the other three made the State meet during their day at King. The 4x800 team of Carissa Avila, Pendleton, Joelle Ramos and Amanda Sosa all ran very solid legs each to take the stick across in 4th. In the field, Courtney Klosinski continued her early season accomplishments with a 3rd place finish in the shot put, going 36-6.5, just a few inches off her PR. In the open division of the long and triple jumps, Alyssa Drake took 1st and 2nd respectively, while Gabriela Sanabria took fourth in the invite section of the triple, going 34' 2.5". Sissy underwood was 5th in the invite portion of the long jump with a leap of 16-6. The spread of talent on King's team was evident throughout the day but what was, perhaps, more encouraging was the team part of the 2016 season that was more rewarding. King may have crashed a San Diego party, but at least they did it together. The 2016 campaign notched its second and third victories of the short season on Thursday as all four squads won by significant and large margins over Hemet and Chaparral High Schools in the annual double-dual, this time held on Chaparral's brand new all weather track. And while winning is certainly a value of King Track and Field, there still seems to be missing from the early action a sense of collective unity, purpose and connection amid the pieces that make up the very large teams this season. Perhaps its due to relatively easy competition faced this season, or maybe its due to something else entirely, but the core of the team is clearly still something to be pursued as the Big 8 season looms next week. The closest score came in the girls varsity contest where just a couple-dozen points gapped King from the host school. The ladies had some really strong performances that afforded them the win. Tia Parrish scorched the 100 and 200 to score 10 points. Ashley Chruszcz won the 400 with Daniell Abboud and MaryJane Smith also scoring. Freshmen Amanda Sosa and Lauren Peurifoy both scored in the 1600 and the 800. Alyssa Haring ran a solid race to score in the 3200. Sissy Underwood and Alyssa Drake did damage to their competitors in the long and triple jump with Gariela Sanabria winning the later. Courtney Klosinski won the shot. Sarah Ann Frank PR'd in the 100 hurdles, improving on her own #3 AT mark. Neither Hemet nor Chaparral could match what the King boys put down and the gap in the scores was very large as the Wolves amassed over 100 points. It started well with the number-two mark in school history in the 400 relay as Saadiq Jennings, Jaylen Moore, Korey Parsons and Jonathan Essien carried the stick to a mark of 42.78. For Essien the deuces were wild as he would later notch the number 2 time in the 200 finishing second. Daniel Gonzalez ran a come-from-behind effort to snag the win in the 1600 at a very good early-season mark of 4:35.09. Ryan Laudermilk had the floor to himself at the end of the night as he cleared 6-6 in the high jump, matching his best leap from 2015. Dillon Lay and Joshua Fisher went first and second in the 110 hurdles; Lay came back to win the 300 as well. A quartet of Noah Poole, Andrew Wilde, Blake Simpson and Matthew Perez swept the pole vault. So yes, there were the victories, but those wins ... while certainly not hollow ... seemed to be lacking something. Maybe that something, that spark of team comraderie, purpose and poise will come in time and with greater testing that teams still out there in the schedule may create. Only time will tell. The King Wolves were off to their first invitational of the season yesterday in traveling to the 2016 Wildcat Relays held at Paloma Valley High School. With a number of student-athletes unavailable for competition this weekend it was a day of mixed results. There were points in the meet where the coaching staff was running triage for the injured and re-working relay entries all at the same time. As in any invitational, there were some disappointments, but facing some high level competition from schools like Vista Murrieta; Rancho Verde, Yucaipa, Chaparral and Santiago, there was also some fine performances that bode well for the remainder of the season. 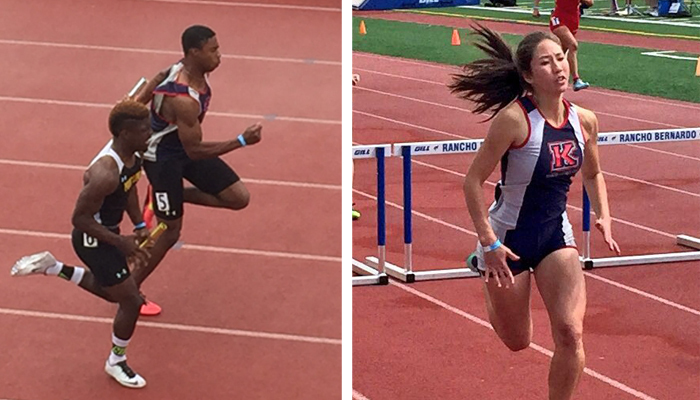 Coach Ken Bracy’s hurdling crew got things off to a fine start as the King shuttle hurdle teams did extremely well. The King girls B team competed at the Divison 2 level of the three level meet and won first place. Destiny Gardner, Sarah Al-Khalili, Danielle Ragan and Jasmine Jimenez did the honors. 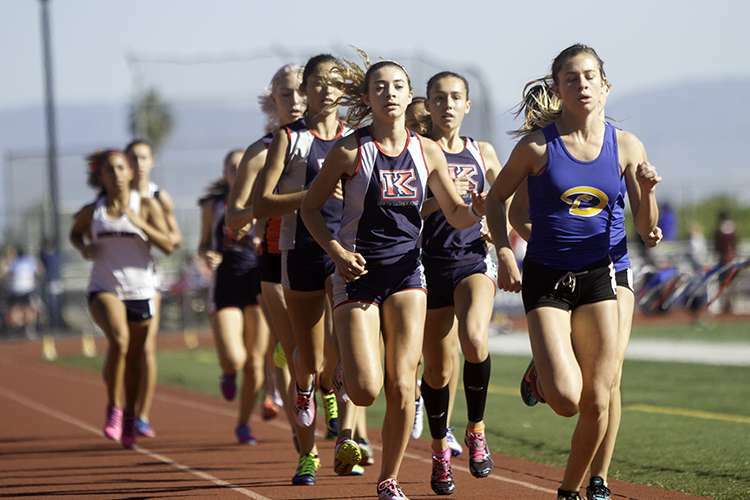 Their Division 1 counterparts –Sarah Ann Frank, Larissa Cesena; Karla Lemus and Amber Hylton finished second to Vista Murrieta by less than a second. The boys team of Dillion Lay; Jacob Knerl; Josh Fisher and Riley Lung won the event in 1:07.72. Both 8 X 200’s finished in third place. The girls 4 X 100 came in second place at 50.36 while the boys ran a very respectable 43.7 for fourth. The girls 4 X 200 team of Mary Jane Smith, Tia Parrish, Sarah Ann Frank and Sydney Reid were just a tick off the school record at 1:46.46. The girls 8 X 100 team salvaged a third place finish with a blazing anchor leg from freshman Anna Barry. Like on the track, performance in the field was uneven. Though there weren’t a lot of team medals won, individual performances gave the team some light. Shaelyn Johnson went 4-10 in the high jump and Madison Canderlaria went 4-8-both PR’s, seemingly filling up a hole in our lineup that Coach Corona had been worried about all pre-season. Marcos Gonzalez, a newbie to the sport, finished second overall in the boys shot put with a toss of 45-5. The Girls shot put team, led by Courtney Klosinski’s toss of 36-1, won first place in the meet. Gabby Sanabria PR’d in both the long jump and triple jump in helping both teams place for medals. Alyssa Drake and Tresure Rucker racked up PR’s in the triple jump as well. On the boys side of things, Dante Anderson duplicated Gabby’s feat with PR’s in both the long and triple jump. First year jumper Hunter Fisk soared to a PR of 36-3 in the triple. The 2016 season started at home against the Rams of Mesa Murrieta. With two large squads representing both schools, the meet went well past the three hour mark as there were multiple heats of the lane events, but when it was all settled and done, King won handily at all four levels. Despite the short season thus far, there were some strong marks recorded. The boys 4x100 team of Carson Walder, Moore, Essien and Jennings launched with the third-best time in school history, going 42.97 for the victory. Courtney Klosinski threw the shot put 36-10.5 to put her name on the 3-spot in King's history in the ring. Freshman Lauren Peurifoy won the 1600 and 3200 with marks that put her 6th fastest ever in those two events for freshmen. So it was an auspicious beginning. But the teams told the story as in event after event there were impressive performances. Tyler Janes, Andrew Boebinger and Daniel Gonzalez swept the 1600, the first sweep of several on the day. Lay, Fisher and Lung swept the 110 high hurdles, Chrusczc, Reid and Drake the girls 400, Peurifoy, Haring and Pendleton in the girls 3200, Gonzalez, Werley and Janes in the boys 3200 and both genders in both relays won. 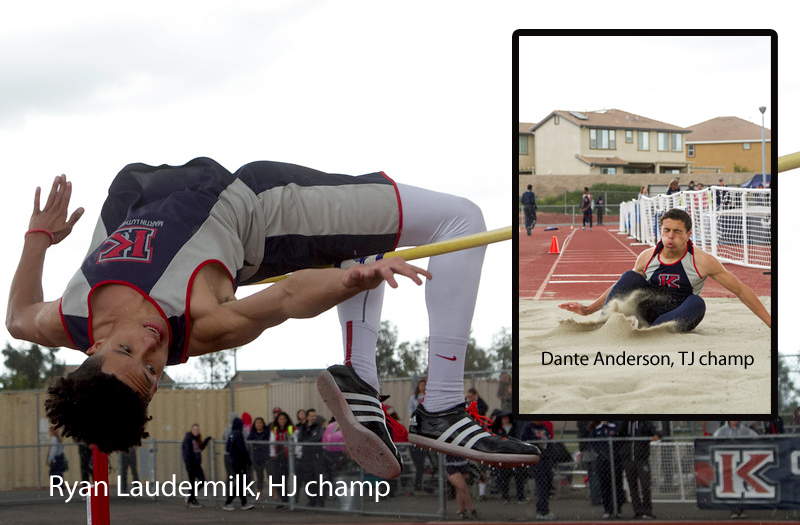 In the field, Anderson, Walder and Bardin took the top three spots in the long jump, Laudermilk, Navarro and Soyemi swept the high jump; with Laudermilk - a CIF Masters qualifier last season opening nicely with a 6-2 leap. Poole, Wilde and Simpson swept the pole vault. The shot put win by Klosinski was backed up by Zavala and Garza in 2nd and 3rd, while Marco Gonzalez, Alec Jones and Tanner Sebastian cleaned up in the boys shot. Jacob Melton won the discus. While there were things the Wolves can definitely improve on as the season goes forth, this meet proved to be a nice beginning to the 2016 campaign. The early NCAA signing period saw three King High Cross Country and Track senior student-athletes sign Letter of Intent to the colleges of their choice this past Monday morning. 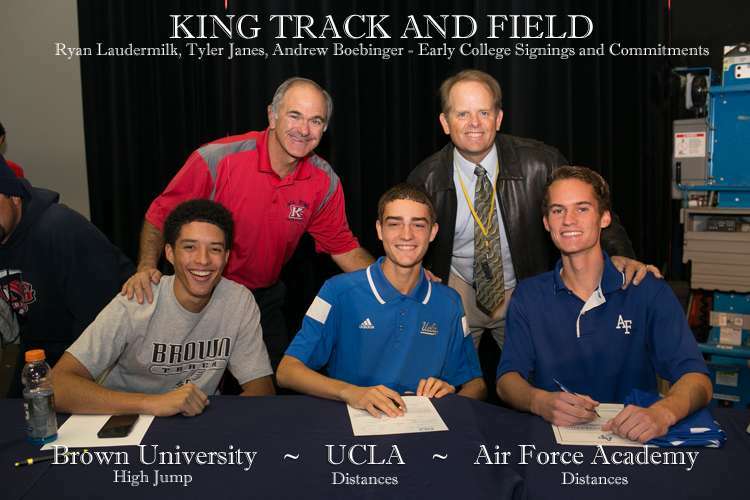 King High will be represented at UCLA by Tyler Janes, who led the Wolves to a state cross country berth in 2014 and finished 8th the state 1600 finals last Spring in track. Tyler follows in the footsteps of Lane Werley, KHS Class of ’11, who has been an All-American for the Bruins. Ryan Laudermilk, a late comer to track, will make Brown University in Providence, Rhode Island his college home. Ryan was a third place finisher in the CIF Division 1 high jump a year ago and was a Master’s Meet qualifier. Andrew Boebinger signed with the Air Force Academy taking his middle distance skills to the Falcon Cross Country and Track programs. He follows fellow Wolf tracksters; Chris Villanueva, Class of ’09, Justin DeCoud, Class of ‘10 and Matt Villanueva, Class of’11 to the Academy. Courtney Kolsinski, our top returning thrower and reigning Big VIII Champion in the Shot Put signed a softball scholarship with Marysville University in St. Louis, Missouri. Former King athlete Ruth Wiggins, now living and competing in Tennessee, signed a Letter of Intent with the University of Arkansas.